Give Your Fingers a Clean, Lustrous Surface to Play! Just what your fingerboard needs! Hydrate from Planet Waves restores the character of your dark, natural wood fingerboards. It's a unique formula of oils and cleaners that makes your fingerboard feel clean and fast with a great-looking, glowing surface. Plus, when you use Hydrate your guitar's fingerboard will be protected from damaging sweat, dirt, and grime. Don't leave your fingerboard out of your regular guitar-care routine. Put a bottle of Hydrate in your guitar case today. 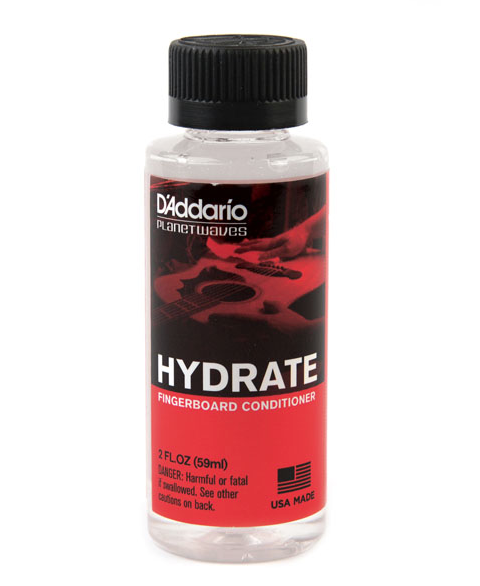 Take care of your guitar's fingerboard with Hydrate fingerboard conditioner from Planet Waves!